Rielus was an Imperial Blades knight who has been trapped as an undead creature imprisoned in the ruined fort of Sancre Tor. You will need to release the Ghost of Rielus as part of the main quest. The first time you explore Sancre Tor, the cursed Blade can be encountered wandering around as an undead, in the northernmost room in the first zone of the ruined fortress. In this form, he will attack you on sight using the unique and enchanted Amulet of the Ansei to block your attacks; upon defeat, his soul will be freed, thus allowing him to help you remove the magic barriers in the Tomb of Reman Emperors. 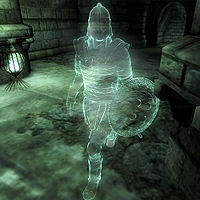 After a brief conversation, the Ghost of Rielus will walk all the way to the tomb and kneel before the magic barriers, in the process removing one of them. After you have claimed the Armor of Tiber Septim, Rielus will disappear and finally find his peace in Aetherius. Rielus wears a complete set of blades armor; helmet, cuirass, gauntlets, a shield, greaves and a pair of boots. He wields an Akaviri katana and carries a small sum of gold. Once free, the ghost will greet you by announcing "I was Rielus, loyal Blade of Emperor Tiber Septim. I do not know how long I have been dead. It feels like an eternity." On subsequent greetings, he will angrily ask "Why do you disturb me? I must free the Shrine so that I can sleep. It has been so long since I have slept." The only real rumor about Rielus comes from Jauffre, who will tell you that "The four mightiest Blades of Tiber Septim's day, Alain, Valdemar, Rielus, and Casnar, went to Sancre Tor and never returned. ", although Casnar will ask "Have you seen Alain or Valdemar? Rielus fell in the lower chamber." The statistics provided here are for the version of Rielus that appears after you have killed him. The original version that you have to fight and kill is a skeleton, whose statistics are provided in his Undead Blade listing.